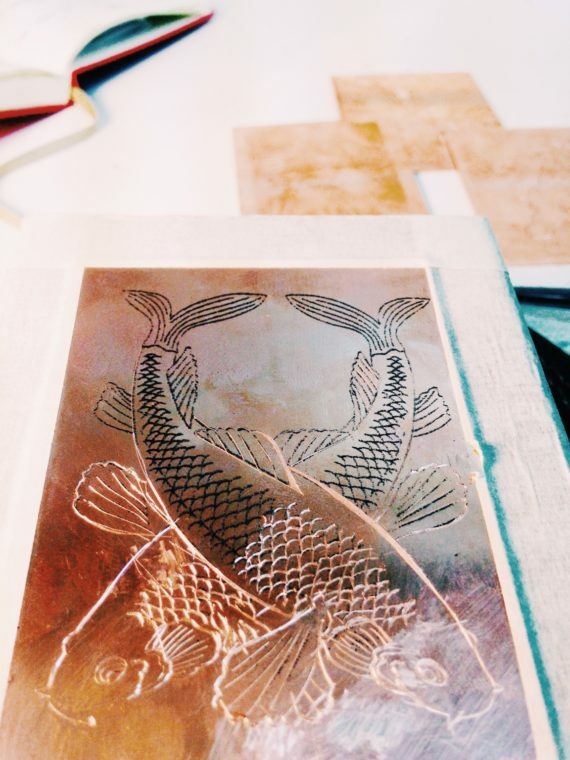 This blog will follow the process of learning hand-engraving under the Hand Engravers Association of Great Britain at Craft Central, London. My practice as an illustrator has always relied on detailed, fineline hand drawings. It has always been my most instinctive means of visual communication. As I have matured as an artist, I have become increasingly curious about translating my drawings onto other mediums. As a self taught artist, I am always seeking new opportunities to expand my artistic education. In 2015, I created a range of illustrated ceramics on Staffordshire fine bone china, finished in gold. The process of designing for physical objects, rather than my sketchbooks, was challenging and immensely rewarding. Following this, I worked with artist Leigh Cameron to create 9 concrete pieces each featuring delicate female nudes. Concrete is a versatile, fascinating (and temperamental) material to work with, and I really enjoyed having the material dictate the design, rather than the other way around. I was thrilled to be the recipient of an a-n professional development bursary with the view of working with a new material: copper. 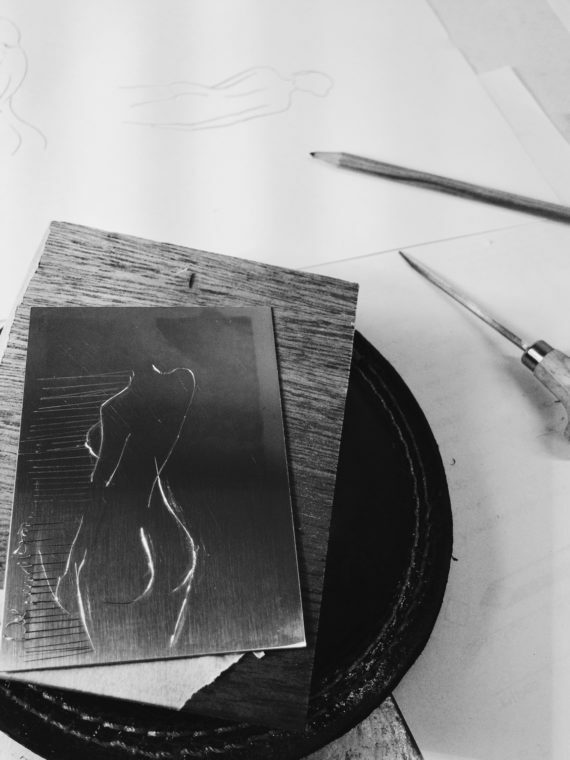 This blog documents the intensive process of learning to hand-engrave and the impact it has since had on my career. As difficult as engraving is to learn, there is truth to the fact that practice makes (somewhat) perfect. Devoting hours a day to one design, allowing for breaks and the occasional tear, is normal. Accepting that you will make mistakes reduces the pressure. There is a meditative quality to the sheer concentration of engraving, and it’s one I started to appreciate. 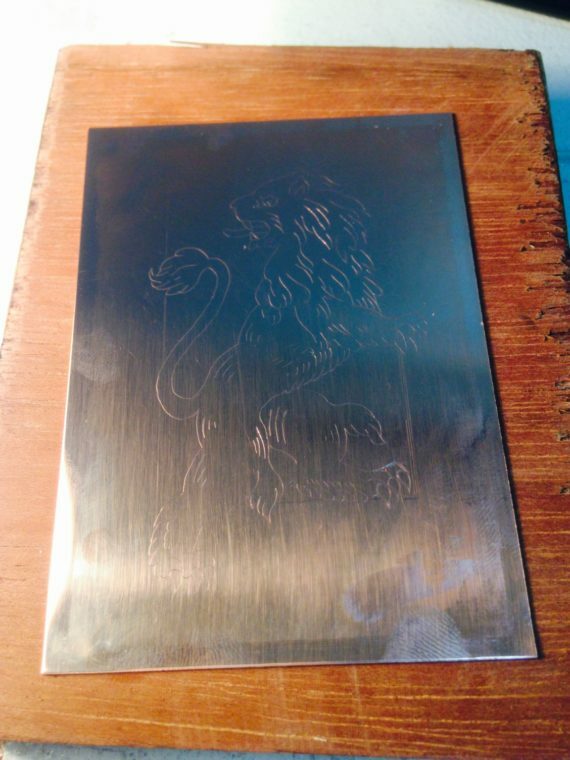 I have always loved the finish of metal engraving, and there was nothing quite like the pride of finishing my first, mistakes and all. The insight that hand-engraving gave me has been invaluable. Not simply the ability to create your own work, but to understand others. I have developed a deeper appreciation of a subject I have always admired. Following the course, a long-term jewellery client Monica Vinader invited me to host ‘Doodle Workshops’. These workshops involve me creating bespoke illustrations and calligraphy to be engraved into pendants and bracelets. It is a project I adore, and over the last year I have hosted these workshops at Harrods, Selfridges, Liberty London and several Monica Vinader boutiques. I work with a master engraver to realise these designs, and I love that I am able to continue learning. With all the preparation done, I was aching to start engraving. My initial thoughts were that it is like drawing in reverse. To have the best control over your line, it is worth keeping a constant pressure. This means that you tend to move the metal, rather than your hand, to create the shape. My first few attempts, in all honesty, were fraught with mistakes. I was slightly comforted to know I wasn’t the only one, but it taught me the most fundamental part of engraving is patience. One thing I struggled with was keeping the engraver at the angle of set, which is about 30 degrees. I remember being taught at school how to hold a pencil properly, but despite my teacher’s best efforts, it wouldn’t stick. Inelegant though it is, I currently hold a pen/pencil almost in a clenched fist. It is pure concentration reminding myself to keep it flat, as all my muscle memory implores me to do the opposite. By keeping it flat, you have control over the depth of the line and are more likely to avoid breaking the tip of your engraver, which requires you to go back to square one. For a smooth, wide line you push hard and then maintain the angle. For straight lines, this is really satisfying. Feeling yourself slide through the metal looks and feels beautiful, until you have to face a curve. Note the quality of the straight lines, next to the jagged curves. My biggest obstacles when engraving are curves, and slipping, which tend to occur at the same time. To successfully create a curve with the same width as your straight line, you move the metal and keep your hand still, with the graver rotating slightly away from you. More often than not, upon reaching a curve, I either end up digging into it, so the depth is different and creates a jagged rather than smooth line, or slipping. Slipping is when you slide straight off your design towards the edge of the metal, leaving a permanent mark. This can be aided with polish, but is one of the single most frustrating things about the process! The ultimate truth to engraving, is patience. If you find yourself frustrated, take a break. If you make a mistake, remember that when the design is complete, it will be less noticeable. Mistakes can be worked around. Breathe and come back to it. The beauty of it is in it’s traditional complexity, and there are no short-cuts. One thing quite particular to engraving is the amount of preparation. From the tools themselves to preparing the metal to transferring the design, it is a patient practice. The practical side of the preparation alone is time consuming – and this is assuming you have your design perfected before beginning! After learning to both make and preserve our own tools, we moved on territory that felt more familiar to me: transferring. 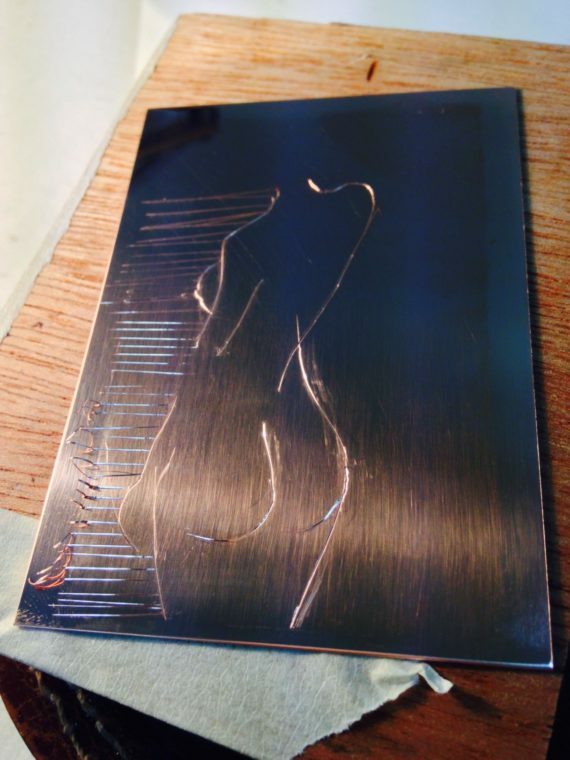 While possible to engrave free-hand into the copper, the laborious nature of it means I much prefer to ensure that the composition and placement of the design is perfect before committing to engraving. There are a variety of ways to do this. The first I learnt was using a mix of coloured and clear acetate. This method involves flipping the design, so using a deliberately backwards design is essential. After either drawing or tracing into the clear acetate, we grated black pastel into the traced acetate, allowing it to serve as a stencil for our design. 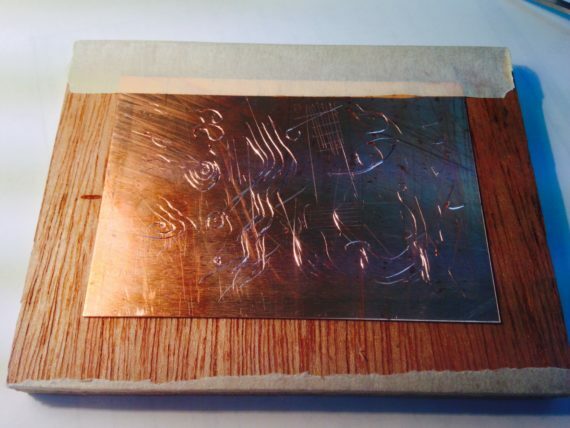 Meanwhile on the copper itself, we rolled plasticine on the surface to ensure it was dull and would hold the transfer. 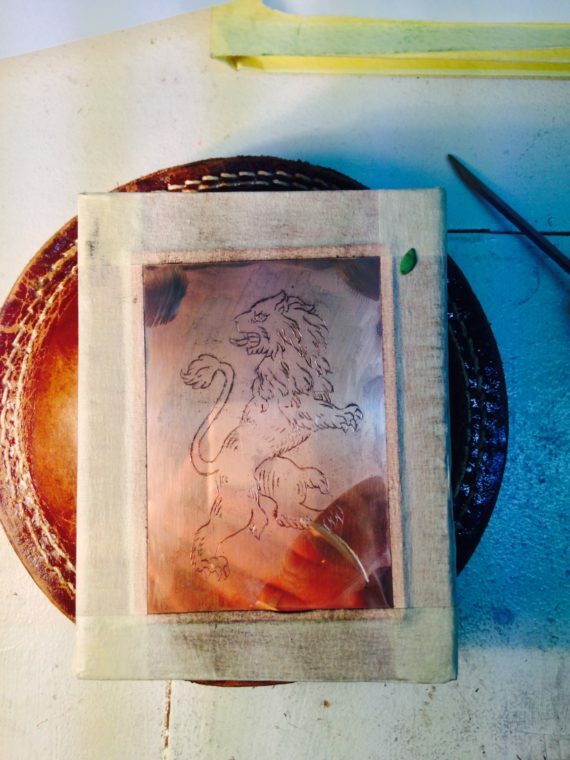 After fixing the acetate and burnishing to the copper, you had a perfect temporary outline to begin working into with your scriber. Plasticine is the hero of this, as it not only holds the transfer but can also be used as a rubber to neaten up any mistakes. The lines of the scriber are so delicate, it is quite a nice finish all of it’s own, although only clear in certain lights. A quicker (and less messy) but more expensive method uses laser prints. 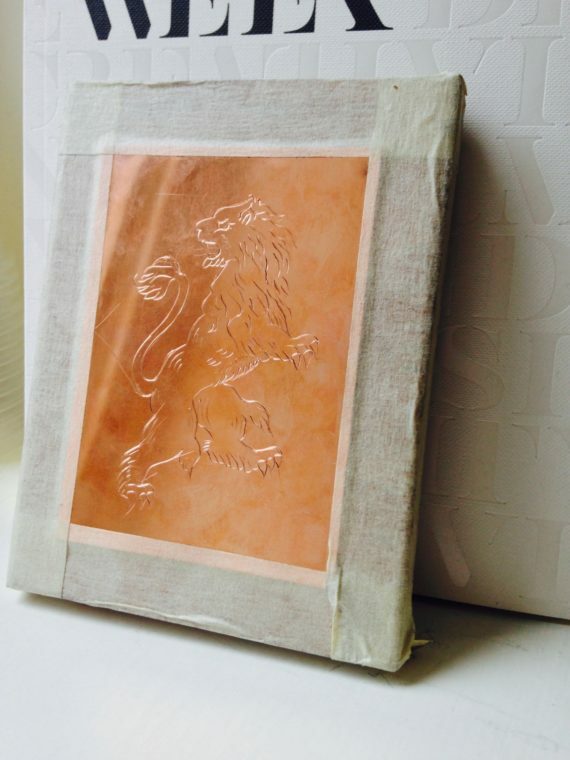 You can use nail varnish to blot over the laser print design and it will transfer straight to the copper. Plasticine again can be used to correct mistakes. As a lightbox addict, I am very grateful for transferring. It is calming and gives confidence about the end design, which I much needed to get through the painstaking and occasionally painful process of engraving. The thing I first realised upon starting the hand-engraving course with the Hand Engravers Association of Great Britain is that I knew absolutely nothing about engraving. With my head full of ideas and possible executions, in all honesty I hadn’t given much thought to the details. 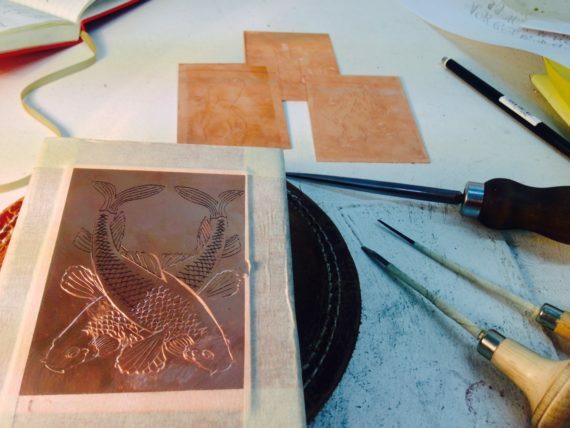 Our instructor Wayne focused on instilling a thorough knowledge of not just the physical act of engraving, but on how to create, maintain and understand your own tools to ensure a sustainable practice. The first thing to do was make our own scriber. The scriber serves essentially like a pencil – sharp enough to mark the copper and guide your engraving, without being deep enough to be permanent. After covering the end with soap, we heated the steel to a bright, cherry red (avoiding both the direct tip of the future scriber and the blue part of the flame) and then immediately cooled it in water. Once it was cleaned, we tempered the steel by reheating and checking the end was hard enough. Next, to round and sharpen the point. To sharpen, we rotated the future scriber at a 40 degree angle on an oil stone covered in baby oil. We rounded it by constantly rotating at the same 40 degree angle, then pulling it back to straight. To ensure it was sharp enough, we tested it on our nail. The perfect amount of sharp will stick to the nail, while a round end won’t mark the nail. In order to engrave, we sanded the graver into shape by rotating the file at the end to create a sharp point, then sanding two points into the rounded end so it’s has two ridges that will be able to cut through the metal. I found the process of both making your own tools and learning to really care for them really enlightening. I have never made my own pen or pencil, and it was quite special gaining a true understanding of the tools you will be working with.